vegetables | This Girl’s Gotta Eat! 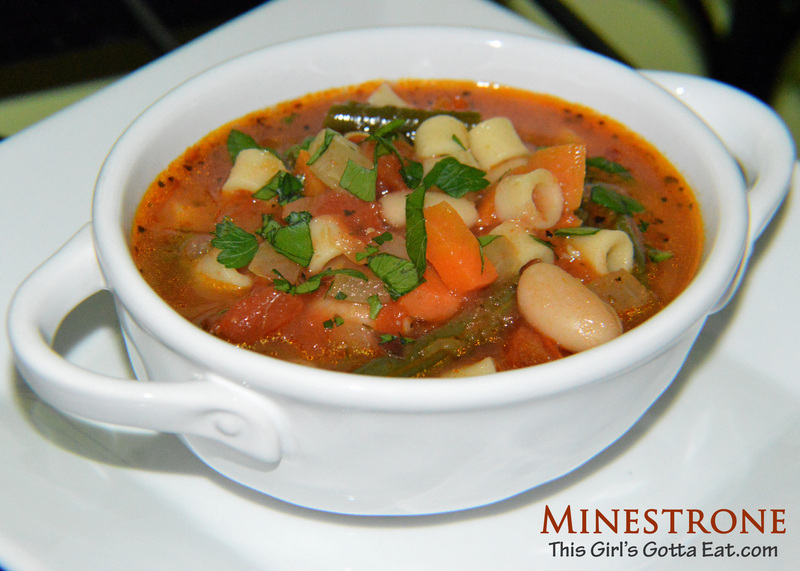 This is a healthy and comforting Italian soup, sure to wrap you in warmth even on the coldest of winter days! It’s loaded with veggies and is a great option for meatless Mondays, or to enjoy during Lent. Mangia! Heat oil in a large pot over medium-high heat. Add onion and cook until translucent, about 4 minutes. Add garlic and red pepper flakes and cook 30 seconds until fragrant. Add celery and carrot and cook until they begin to soften, 3-5 minutes. Add tomato paste, dry herbs and salt and pepper to taste. Cook, stirring around, for about a minute. Deglaze the pan with wine and cook until nearly evaporated. Next add the chicken broth and tomatoes and bring to a boil. Reduce heat to low and simmer for 10 minutes. Stir in green beans and cannellini beans and cook for 5 minutes. Finally, add the pasta and cook 10 minutes more. Season with salt to taste. Serve with lots of cheese and parsley for garnish. Cook mushrooms and thyme in 6 Tbsp oil in a saute pan over medium heat until softened, about 5 minutes. Stir in flour and cook 1 minute. Deglaze the pan with 1/2 cup sherry; cook until nearly evaporated. Whisk in broth and milk; cook until thickened to desired consistency, 10-12 minutes. Add lemon juice; season with salt, pepper and a little more sherry to taste. Remove from heat and stir in turkey and minced vegetables. Pour into a 9 x 13 baking dish sprayed with non-stick spray. Place the 9 x 13 on a baking sheet lined with foil, in case any of it bubbles over while cooking. Alternatively, you could also use four 1 and a 1/4 to 1 and 1/2- cup ovenproof baking dishes arranged on a baking sheet. Place a phyllo sheet on a flat surface; and cover the remaining sheets with a damp towel while you work. Working fast, roll each phyllo sheet into a loose tube. Place rolled tube on top of casserole. Repeat by rolling up and placing on top of casserole until the top is completely covered. 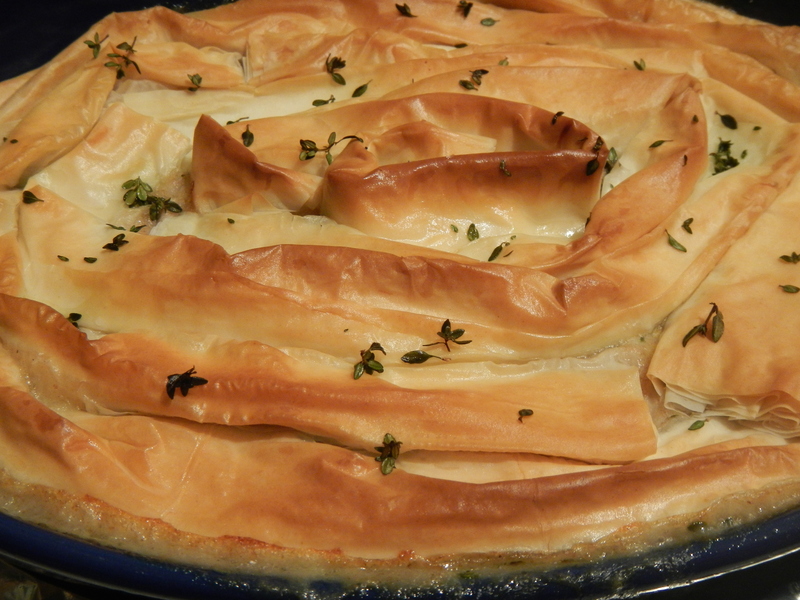 The number of phyllo sheets needed will depend how tight you roll them into tubes, I’d say 8-10 total. Brush with a little oil over the top of the casserole and sprinkle with a little thyme for color. Bake until crust is golden and filling is bubbly, about 30-40 minutes (note: if you use the individual baking dishes, you should only have to bake for about 20 minutes). 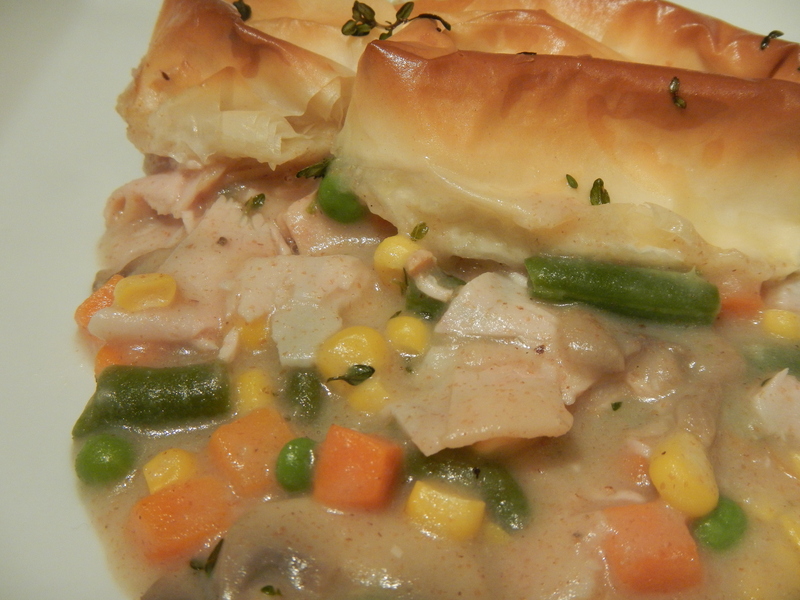 Let casserole cool for 10 minutes before serving. A from-scratch stir-fry sauce helps you avoid the extra sodium and sugars most bottled sauces contain. This one is easy and delicious, and has half the sodium of a typical Chinese take-out dinner. The recipe says you can get this all-natural stir-fry on the table in 30 minutes. I timed myself and it took 40. I could have shaved some time off if I had done a little prep ahead of time though. Combine pork strips and 1 Tbsp soy sauce; cover and refrigerate while preparing the rice and sauce. For the rice: boil 1 cup broth, half the ginger (1 Tbsp) and rice in a saucepan over medium-high heat. Reduce heat to simmer and cover. Simmer rice until water is absorbed, 5 minutes or according to your package directions. Leave covered off heat for 5 more minutes. Fluff the cooked rice with a fork and stir in the pineapple, 1 Tbsp soy sauce, 1 tsp sesame oil and 1/4 tsp salt (if you feel you need the extra salt). Keep rice warm and covered until ready to serve. For the sauce: whisk together 2 Tbsp soy sauce, 1/2 cup broth, sherry, cornstarch, honey, tomato paste and a pinch of pepper. Set aside. Preheat work (or large skillet) and spray with non stick spray. Heat 1 tsp canola oil and stir-fry half the pork until cooked through, 2-3 minutes. Transfer pork to a plate and stir-fry the remaining pork; transfer to same plate. Add remaining 1 tsp canola oil, garlic and the rest of the ginger (1 Tbsp); stir-fry 10-15 seconds. Add sugar snap peas; stir-fry 2 minutes. Return pork to pan; add sauce and cook until sauce thickens; 1-2 minutes. Add carrots; stir-fry 1 minute. 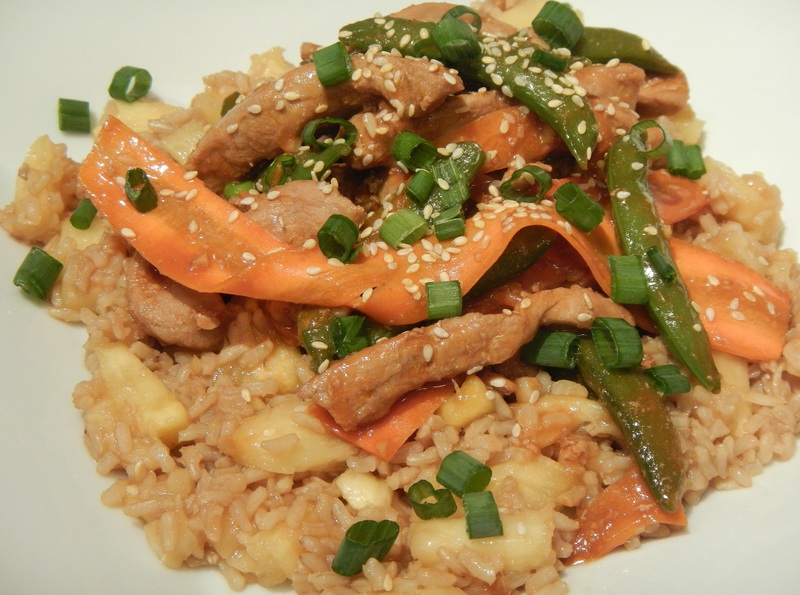 Serve pork stir-fry over the pineapple rice and garnish with scallions and sesame seeds. Season salmon with salt and pepper. Grill until done to your likeness, turning once half-way through. Remove from grill and let rest a minute or two. Meanwhile, in a large skillet, heat 2 Tbsp olive oil over medium-high heat. Add the corn and lightly brown, 3-5 minutes. Add the zucchini, scallions, red pepper flakes and garlic. Season with salt and pepper to taste, and cook to soften, 3-4 minutes. Deglaze the pan with some dry, white wine – a good turn of the pan. Be sure to scrape up any brown bits that may have formed on the bottom of the pan. Add spinach and wilt, a few minutes. Next, add the butter and stir to melt, creating a creamy sauce. Remove from the heat and toss with tomatoes and herbs. In another bowl, toss the arugula with some olive oil, fresh lemon juice and salt and pepper to taste. Do not overdress. To serve: Divide zucchini-corn mixture among plates. Top with a piece of salmon, then top salmon with some pesto (I had just made pesto from all the basil in my garden, but you can use store-bought as well). 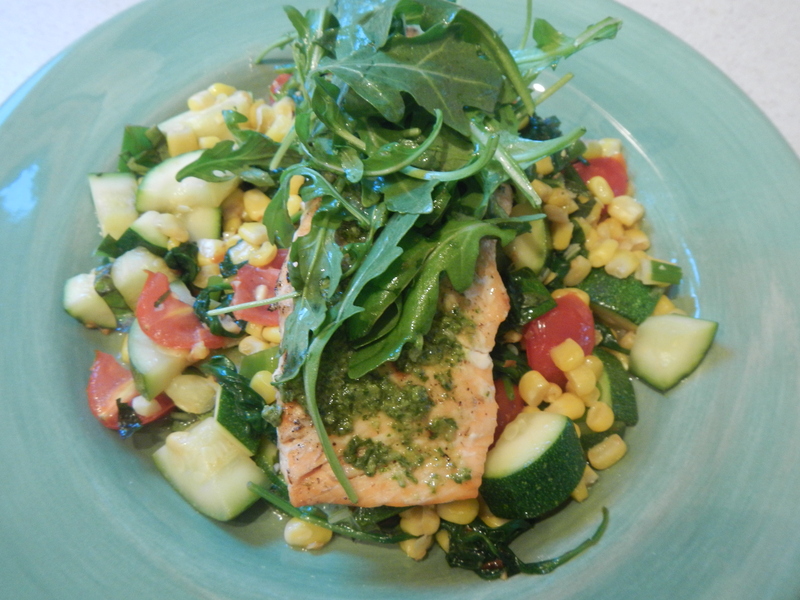 Next, divide dressed arugula to top each salmon piece. There’s something about topping meat with shrimp that makes the meal feel fancier. I don’t know if it’s just because we’re used to paying more for surf n’ turf or that the combo of seafood and meat has a higher perceived value when we dine in a restaurant. 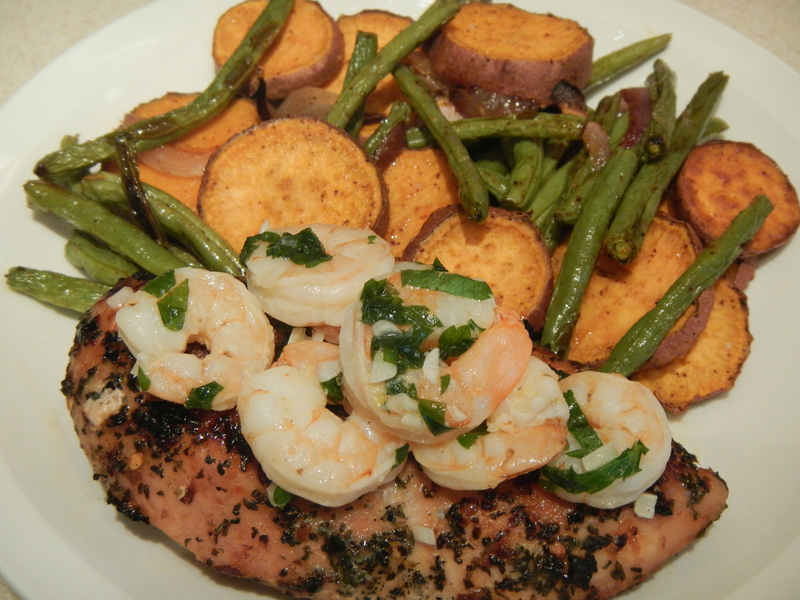 But either way, topping this simple grilled chicken with shrimp and a tasty sauce really took this dinner up a notch! Preheat oven to 400 degrees. Also, preheat grill to medium-high heat. Season chicken with salt, pepper, garlic powder, dried basil, dried parsley and red pepper flakes to taste. Top with lemon zest and drizzle with olive oil. Let marinate in the fridge until you’re ready to grill. In a large bowl, combine sweet potatoes, onion and green beans and toss with a little olive oil, salt, pepper and garlic powder. Spread evenly in one layer on a non-stick baking sheet (sprayed with non-stick spray). Roast in the oven until sweat potatoes are fork tender and start to brown. About 20 minutes. Once done, remove the veggies and finish with a little kosher salt. Grill the chicken about 5-6 minutes per side until juices run clear. Remove from grill, cover with foil, and let rest 5 minutes. While the chicken is resting, cook the shrimp. Melt a Tbsp or so of butter (or butter substitute) in a medium skillet over medium-high heat. Add garlic and cook for a minute. Next add the shrimp and the juice of the lemon you zested. Saute, tossing occasionally until shrimp is pink – no more than 5 minutes. About half way through, add a little white wine – a turn or two of the pan. Finish sauce off heat with fresh chopped parsley. 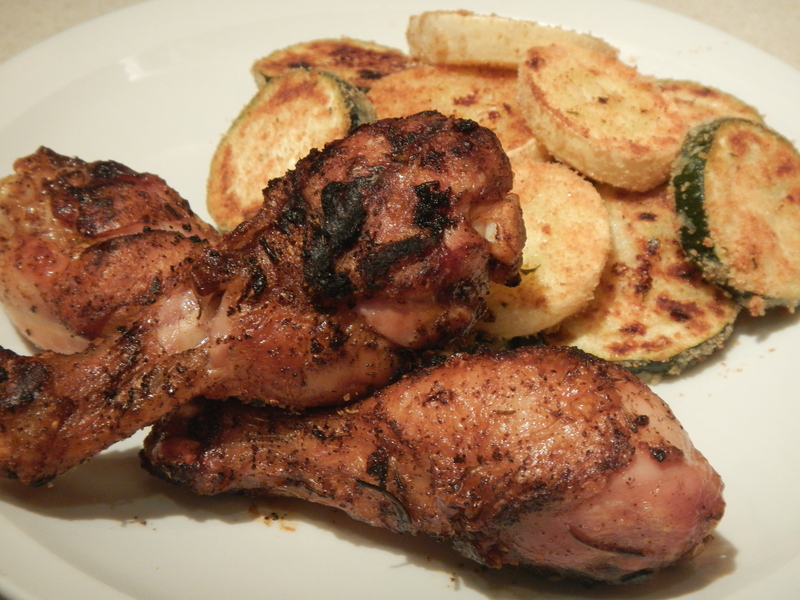 Serve chicken breast along with roasted veggies. Top chicken with the sauteed shrimp and spoon the sauce on top of both the shrimp and chicken. Categories : Chicken, Fish, Satisfy, This girl has recipes! Chop the cauliflower into florets and pulse in a food processor until the consistency of “rice” forms. Saute the “rice” in a little olive oil over medium heat until the cauliflower is cooked and translucent, about 8 minutes. Season with salt, pepper and garlic powder to taste. Meanwhile, make the marinade for your pork and veggies. Whisk together a couple heads a minced garlic, about a 1/2 Tbsp or so of fresh ginger minced from the tube and about 1/4 cup of soy sauce. Toss marinade with veggies and pork and marinate for 15 to 20 minutes. Stir fry veggies and pork in oil in a hot wok until pork is cooked. To make the stir frying easier, you may want to do the veggies first, remove and set aside and then stir fry the pork to get an even cook. Serve pork and veggies over cauliflower rice and soy sauce on the side.